Austin Fay and Brian List discuss GMP processing services at Jet and the new ISO8 suite with Tablets and Capsules. Founded in 1946, Jet Pulverizer, Moorestown, NJ, designs and manufactures high-energy spiral jet mills in a variety of sizes. It also offers contract milling, which it performs using jet mills, hammer mills, or other mechanical mills. 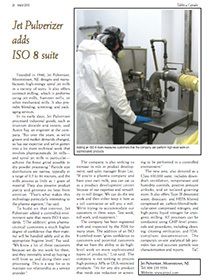 It also provides blending, screening, and packaging services. In its early days, Jet Pulverizer processed industrial goods, such as titanium dioxide and toners, said Austin Fay, an engineer at the company. “But over the years, as we’ve grown and market demands changed, so has our expertise and we’ve gotten into a lot more technical work that involves pharmaceuticals. Jet mills – and spiral jet mills in particular – achieve the finest grind possible in dry powder processing.” Particle size distributions are narrow, typically in a range of 0.5 to 44 microns, and the mills process as little as 1 gram of material. They also preserve product purity and generate no heat from attrition. “That’s what makes this technology particularly interesting to the pharma segment,” Fay said.